Last week we noted that it may be a sign of a maturing robotics industry that it's possible to have companies specializing in something as small as fingertips for a robot hand. This week, the workshop day kicking off this year's We Robot conference provides a different reason to think the same thing: more and more disciplines are finding their way to this cross-the-streams event. This year, joining engineers, computer scientists, lawyers, and the odd philosopher are sociologists, economists, and activists. The result is oddly like a meeting of the Research Institute for the Science of Cyber Security, where a large part of the point from the beginning has been that human factors and economics are as important to good security as technical knowledge. This was particularly true in the face-off between the economist Rob Seamans and the sociologist Beth Bechky, which pitted quantitative "things we can count" against qualitative "study the social structures" thinking. The range of disciplines needed to think about what used to be "computer" security keeps growing as the ways we use computers become more complex; robots are computer systems whose mechanical manifestations interact with humans. This move has to happen. One sign is a change in language. Madeline Elish, currently in the news for her newly published 2016 We Robot paper, Moral Crumple Zones, said she's trying to replace the term "deploying" with "integrating" for arriving technologies. "They are integrated into systems," she explained, "and when you say "integrate" it implies into what, with whom, and where." By conrast, "deployment" is military-speak, devoid of context. I like this idea, since by 2015, it was clear from a machine learning conference at the Royal Society that many had begun seeing robots as partners rather than replacements. Later, three Japanese academics - the independent researcher Hideyuki Matsumi, Takayuki Kato, and Pumio Shimpo - tried to explain why Japanese people like robots so much - more, it seems, than "we" do (whoever "we" are). They suggested three theories: the influence of TV and manga; the influence of the mainstream Shinto religion, which sees a spirit in everything; and the Japanese government strategy to make the country a robotics powerhouse. The latter has produced a 356-page guideline for research development. "Japanese people don't like to draw distinctions and place clear lines," Shinto said. "We think of AI as a friend, not an enemy, and we want to blur the lines." Shimpo had just said that even though he has two actual dogs he wants an Aibo. Kato dissented: "I personally don't like robots." The MIT researcher Kate Darling, who studies human responses to robots, found positive reinforcement in studies that have found that autistic kids respond well to robots. "One theory is that they're social, but not too social." An experiment that placed these robots in homes for 30 days last summer had "stellar results". But: when the robots were removed at the end of the experiment, follow-up studies found that the kids were losing the skills the robots had brought them. 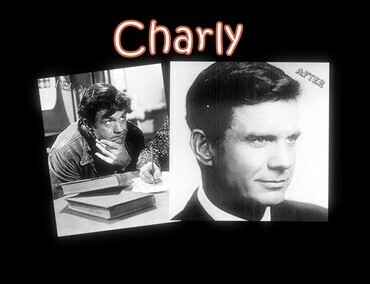 The story evokes the 1958 Daniel Keyes story Flowers for Algernon, but then you have to ask: what were the skills? Did they matter to the children or just to the researchers and how is "success" defined? The opportunities anthropomorphization opens for manipulation are an issue everywhere. Woody Hartzog called the tendency to believe what the machine says "automation bias", but that understates the range of motivations: you may believe the machine because you like it, because it's manipulated you, or because you're working in a government benefits agency where you can't be sure you won't get fired if you defy the machine's decision. Would that everyone could see Bill Smart and Cindy Grimm follow up their presentation from last year to show: AI is just software; it doesn't "know" things; and it's the complexity that gets you. Smart hates the term "autnomous" for robots "because in robots it means deterministic software running on a computer. It's teleoperation via computer code." This is the "fancy hammer" school of thinking about robots, and it can be quite valuable. Kevin Bankston soon demonstrated this: "Science fiction has trained us to worry about Skynet instead of housing discrimination, and expect individual saviors rather than communities working together to deal with community problems." AI is not taking our jobs; capitalists are using AI to take our jobs - a very different problem. As long as we see robots and AI as autonomous, we miss that instead they ares agents carrying out others' plans. This is a larger example of a pervasive problem with smartphones, social media sites, and platforms generally: they are designed to push us to forget the data-collecting, self-interested, manipulative behemoth behind them. Returning to Elish's comment, we are one of the things robots integrate with. At the moment, this is taking the form of making random people research subjects: the pedestrian killed in Arizona by a supposedly self-driving car, the hapless prisoners whose parole is decided by it's-just-software, the people caught by the Metropolitan Police's staggeringly flawed facial recognition, the homeless people who feel threatened by security robots, the Caltrain passengers sharing a platform with an officious delivery robot. Did any of us ask to be experimented on? Illustrations: Cliff Robertson in Charly, the movie version of "Flowers for Algernon". The futurist Anders Sandberg has often observed that we call it "artificial intelligence" only as long as it doesn't work; after that it's simply "automation". This week, Rich Walker, the managing director of Shadow Robot, said the same thing about robotics. No one calls a self-driving car or a washing machine a robot, for example. Then again, a friend does indeed call the automated tea maker that reliably wakes up every morning before he does "the robot", which suggests we only call things "robots" when we can mock their limitations. Walker's larger point was robotics, like AI, suffers from confusion between the things people think it can do and the things it can actually do. The gap in AI is so large, that effectively the term now has two meanings, a technological one revolving around the traditional definition of AI, and a political one, which includes the many emerging new technologies - machine learning, computer vision, and so on - that we need to grapple with. When, last year, we found that Shadow Robot was collaborating on research into care robots it seemed time for a revisit: the band of volunteers I met in 1997 and the tiny business it had grown into in 2009 had clearly reached a new level. Social care is just one of many areas Shadow is exploring; others include agritech and manufacturing. "Lots are either depending on other pieces of technology that are not ready or available yet or dependent on economics that are not working in our favor yet," Walker says. Social care is an example of the latter; using robots outside of production lines in manufacturing is an example of the former. "It's still effectively a machine vision problem." That is, machine vision is not accurate enough with high enough reliability. A 99.9% level of accuracy means a failure per shift in a car manufacturing facility. Getting to Shadow Robot's present state involved narrowing down the dream founder Richard Greenhill conceived after reading a 1980s computer programming manual: to build a robot that could bring him a cup of tea. The project, then struggling to be taken seriously as it had no funding and Greenhill had no relevant degrees, built the first robot outside Japan that could stand upright and take a step; the Science Museum included it in its 2017 robot exhibition. Greenhill himself began the winnowing process, focusing on developing a physical robot that could function in human spaces rather than AI and computer vision, reasoning that there were many others who would do that. Greenhill recognized the importance of the hand, but it was Walker who recognized its commercial potential: "To engage with real-world, human-scale tasks you need hands." The result, Walker says, is, "We build the best robot hand in the world." And, he adds, because several employees have worked on all the hands Shadow has ever built, "We understand all the compromises we've made in the designs, why they're there, and how they could be changed. If someone asks for an extra thumb, we can say why it's difficult but how we could do it." Meanwhile, the world around Shadow has changed to include specialists in everything else. Computer vision, for example: "It's outside of the set of things we think we should be good at doing, so we want others to do it who are passionate about it," Walker says. "I have no interest in building robot arms, for example. Lots of people do that." And anyway, "It's incredibly hard to do it better than Universal Robots" - which itself became the nucleus of a world-class robotics cluster in the small Danish city of Odense. Specialization may be the clearest sign that robotics is growing up. Shadow's current model, mounted on a UR arm, sports fingertips developed by SynTouch. 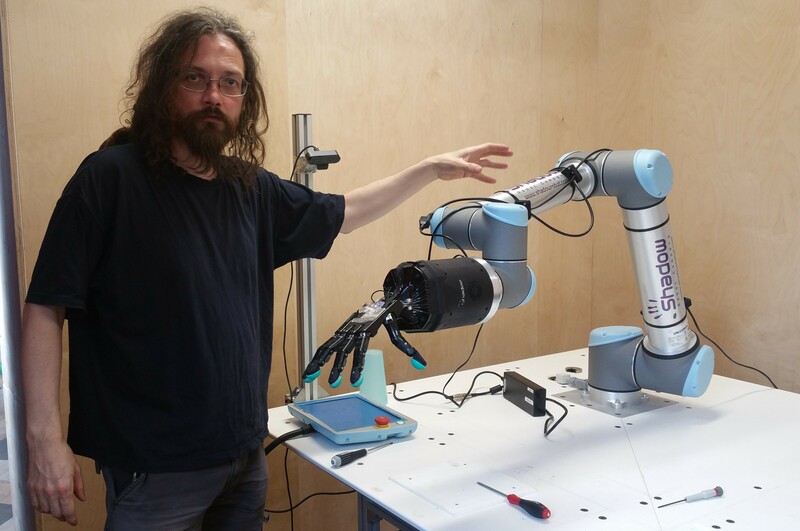 With SynTouch and HaptX, Shadow collaborated to create a remote teleoperation system using HaptX gloves in San Francisco to control a robot hand in London following instructions from a businessman in Japan. The reason sounds briefly weird: All Nippon Airways is seeking new markets by moving into avatars and telepresence. It sounds less weird when Walker says ANA first thought of teleportation...and then concluded that telepresence might be more realistic. Shadow's complement of employees is nearing 40, and they've moved from the undifferentiated north London house they'd worked in since the 1990s, dictated, Walker says, by buying a new milling machine. Getting the previous one in, circa 2007, required taking out the front window and the stairs and building a crane. Walker's increasing business focus reflects the fact that the company's customers are now as often commercial companies as the academic and research institutions that used to form their entire clientele. For the future, "We want to improve tactile sensing," Walker says. "Touch is really hard to get robots to do well." One aspect they're particularly interested in for teleoperation is understanding intent: when grasping something, does the controlling human want to pinch, twist, hold, or twist it? At the moment, to answer that he imagines "the robot equivalent" of Clippy that asks, "It looks like you're trying to twist the wire. Do you mean to roll it or twist it?" Or even: "It looks like you're trying to defuse a bomb. Do you want to cut the red wire or the black wire?" Well, do ya, punk? 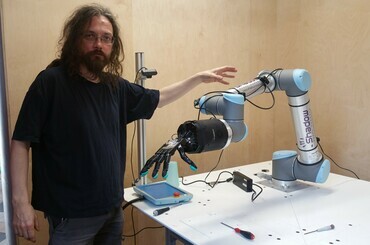 Illustrations: Rich Walker, showing off the latest model, which includes fingertips from HaptX and a robot arm from Universal Robotics; the original humanoid biped, on display at the Science Museum.